Man did not always know diplomacy; much less the need to, or the benefits of, conferring diplomatic immunities or privileges to visitors. In ancient times, emissaries of sovereigns who came to deliver messages -either of war or even of amity- were considered fair game, and often killed. In the 12th Century a particular Roman envoy who was sent to Tarentum in Southern Italy as a harbinger of war, was a little luckier; he was not killed. But he was urinated upon as he left the City, an act about which he even had the luxury of warning his assaulters: “This stain will be washed away with blood!” Needless to say that the Romans, indeed made sure that it was, at the Second Punic War where Hannibal’s Carthage would be defeated and Spain was excised from it for good. But with the passage of time, even ancient sovereigns came to realize the importance of preserving the lives of envoys, emissaries and messengers, -at the very least even if for the purposes of sending and receiving messages -whether between and among friends or foes, or whether in times of peace or of war, or whether amidst the rumbling of arms or even during periods of temporary armistice. This understanding would be the earliest birth point of the concept of diplomacy and the notion of granting diplomatic immunities and privileges to emissaries, envoys and messengers of sovereigns. The Mongolian Emperor Genghis Khan strongly advocated for the rights of emissaries to immunity from harm, and in fact was said to have taken ‘terrifying vengeance’ against states or individuals who did not secure them. Soon the earliest embassies would be actual visits by high ranking representatives rather than permanent establishments as we have them today. And the idea of permanent representation would develop later on the basis of treaty between or among willing states. But the concept of modern diplomatic immunity as we have it today, evolved when the Romans began to award a ‘special status’ to their envoys on a bilateral, ad hoc basis. And with the development of modern embassies, permanent missions and legations during Europe’s Renaissance, the principles of contemporary diplomatic immunities and privileges were extended beyond the diplomatic ‘person’ to the diplomatic ‘premises’ and the diplomatic ‘pouch’ (bag), or what the French refer to as ‘valise diplomatique’ -or ‘diplomatic crate’ if you have that infamous ‘crating’ of Nigeria’s Umaru Dikko in mind. Other areas covered by diplomatic immunities and privileges would include ‘diplomatic records’, ‘archives’, ‘correspondences’, ‘customs waivers’, ‘tax exemptions’ and other ‘jurisdictional privileges’. It was after the World War II that these largely bilateral, purely customary international rules were codified into a multilateral standard agreement by means of the Vienna Conventions, first on ‘Diplomatic Relations’ and then on ‘Consular Relations’. These Conventions now largely regulate the conferment of diplomatic immunities and privileges to diplomatic agents, consular officers and to high ranking administrative, political, judicial and military personnel. The modern concept of diplomatic immunities and privileges is based on two theories: one that supports the granting of unlimited immunity (or the extra-territoriality theory), and the other that supports the conferment of limited immunity necessary only for the performance of diplomatic duties (or the functional necessity theory). But generally, immunities and privileges granted to diplomatic agents or political ‘diplomats’ are classified into four major categories: 1, Personal Inviolability or freedom from search and seizure; 2, Criminal Immunity or exemption from arrest, detention or prosecution; 3, Civil Immunity or exemption from being sued, and 4, Immunity from obligation to testify in criminal or civil proceedings. These are granted in deference to the principles of sovereignty, sovereign equality and mutual respect for the political independence and territorial integrity of states. But they are granted also to representatives of states to some international organizations particularly those of the United Nations and its specialized agencies under a special rule on the Privileges and Immunities of the U.N. of 1946. The classes of diplomatic immunity or privileges that especially heads of state, foreign ministers and other high ranking political persons enjoy are evidenced by the type of diplomatic passports that they bear, and it is safe to assume that the highest class and to which especially a serving Senate President will most eminently belong, enjoys the most of these privileges. In fact a Senate President, being the head of an arm of the Government, may even come under the cover of yet another U.N. Convention established to secure ‘Internationally Protected Persons’, including but not limited to Heads of State and members of their families. And so almost any head of a parliament, is virtually as preeminently qualified as the President to engage the embassies of any friendly states and to initiate or to resolve or conclude any matters ranging from the ‘diplomatic’ (particularly concerning inter-parliamentary matters) even to the ‘consular’ (relating to cultural issues and matters concerning the issuance or non issuance of visas). And thus the question arises: could the Senate President, Bukola Saraki, -cued by expert lobbyists familiar with the numb and sensitive nerves of America’s foreign relations- have engaged the United States Embassy in the guise of this eminent privilege which the Senate President enjoys, and with the involvement of a friendly former Military and civilian Head of State Olusegun Obasanjo, to end the ten-year visa drought imposed on the former Vice President Atiku Abubakar? Or by the way, could the United States herself have been eagerly waiting to be approached at such high ranking level to resolve the impasse in order to avoid the potentially embarrassing possibility of a State Department’s capitulation in the event that a persona non grata becomes the President of a strategically important friendly country, Nigeria? The United Nations ‘Convention On Special Missions’ of 1969 permits states under international law to send special or ad hoc missions abroad on technical, political or other important matters of concern to the state. These missions can be initiated by any one or some or all of the three arms of Government, provided that by rule the initiating organ, aside from informing the host state of the size and composition of the mission in advance, also agrees on a place of residence for the missioners acceptable by the host state. By the way, such missions may also attract the privilege of expeditious consular treatment in their group request for visas in addition to certain guaranteed group immunities clearly derived from the Vienna Convention, excepting only such immunities with respect to claims arising from vehicular accident used outside the official functions of the mission. Plus, the mission is allowed only such freedom of movement and travel as may be necessary to achieve its objectives. No privilege of voyeurising, no fun fare, no sightseeing. Just step in, do the do, and step out! 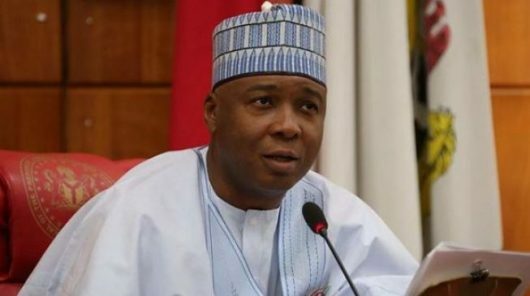 Thus the question again arises: could this have been the metaphorical ‘diplomatic pouch’ referred to by public opinion which the Senate President, Saraki may have used, in the guise of a Special Mission, (and consistent with a strategically-thinking U.S. State Department) to solve the Atiku visa conundrum? Could it? Because America may simply have pretended that what they granted was a prerogative group visa to a ‘Special Mission’ headed by Nigeria’s Senate President and that it did not feel obligated to pry into that virtual ‘bag’ to scrutinize the qualification of members of the ‘Commission’. America has plucked reasons from the void to resolve matters with Taliban members who have killed its citizens. Why should it be difficult for her to look away from the content of a crooked ‘diplomatic pouch’, in order to assist a ‘fugitive’ who has, even if a not-too-bright chance of becoming Nigeria’s President?